Instagram is about to release a new feature called Instagram Nametags. This is to help its users connect faster with each other when meeting in-person. To follow Instagrammers we meet, we have to use the Explore option to search for their accounts. This can be difficult as there millions of profiles, and thousands with similar handles. Instagram Nametags is now the new option. An Instagram Nametag is a custom-image that is unique to each profile. Let’s say Ashley is a socialite and often meets new people. She loves it when people she meets follow her on Instagram. With this new feature, she can simply display her new Instagram Nametag. Her friends can scan this Nametag with their Instagram camera option to follow her. Instagram Nametags is similar to the Snapchat Snapcode or the Facebook Messenger Code or QR Codes used by various other apps today. These are 2D barcodes and work similar to the popular QR Codes used in payments and marketing. While this feature is still in beta and available to few users only, we do have a hint on how it will work. Go to your profile and you will see a new icon that represents ‘scanning of an image’. Use this icon to generate your personal Nametag. The Nametag image can be custom-designed as per one’s liking. This includes changing the background color, keeping it blank, or creating a pattern using emojis. If not emojis, you can use a pattern of AR-edited face filters instead. At the center will be your Instagram handle. Once created, you can show your Nametag to the people you meet. If you are a business or celebrity, you can share it on social media or print on your promotional material. 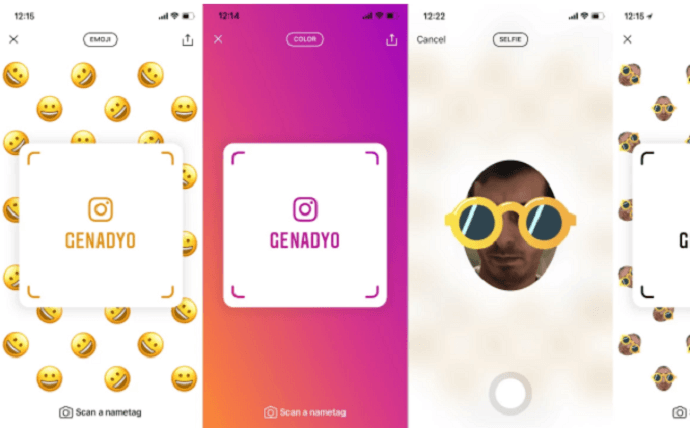 If you need to follow an Instagrammer via the Nametag option, simply open the Stories camera and scan it. The profile of the Nametag owner will open and you can click on the Follow button. Easy. Using the Nametag or QR Code option, Instant Messaging apps are making it easier for users to add each other. This ensures the possibility of increasing followers without sharing personal information. For example, in Whatsapp and iMessage, it is mandatory to share your phone number. Instagram Nametags seems like an exciting feature. Especially because of its cool designing features. The only question is—when will Instagram release it publicly?